Jewelry - Jewelers Mutual | Special Feature | Personal Umbrella - RLI | Webinars | TRIVIA! For many clients, an engagement ring is the most valuable item they own (aside from the home or car) yet very often, it is not insured. This is unnerving when considering all the dangers a ring is exposed to and the loss stories associated with them. It's not always a happy ending when a ring is lost, stolen or damaged. Ask your clients about their jewelry. With a specialty insurer, they will get the best jewelry insurance coverage to protect their investment. If the worst does happen and you clients need to submit a claim, it's important they're taken care of by experts who understand jewelry. After all, not all insurance claims professionals will know the difference between a princess or emerald cut diamond like an expert jewelry insurer would. Big "I" Markets offers agents access to Jewelers Mutual Insurance Group - a company that been insuring jewelry and only jewelry for 105 years. Their specialty jewelry insurance is a standalone policy. It's not connected to any previous coverage they already have so it reduces the stress on homeowners carriers. What's covered? All types of jewelry - engagement rings, watches, earrings, even loose stones being set - are protected by comprehensive repair or replacement coverage that goes beyond typical homeowners or renters insurance. It protects against common perils associated with jewelry loss - like mysterious disappearance, and includes worldwide travel. Take Four Minutes to View Our Cyber "How-To"
Last week's Two for Tuesday highlighted the Cyber-Small Business Solution product. The article contained a lot of information and links, but we wanted to bring one in particular to your attention, the How to Quote Cyber Liability Tutorial. In just four minutes, you can view a live step-by-step demonstration of the cyber submission process. Familiarize yourself with the process and you'll be ready to quickly and easily complete cyber sales through Big "I" Markets. Please contact bigimarkets@iiaba.net with any questions. There's an old expression, "You get what you pay for." So it makes sense that a common misconception among consumers is that millions of dollars in liability coverage must be really expensive. But a personal umbrella liability policy is a very affordable way to obtain a lot of coverage. As an agent, you can educate your clients on how a personal umbrella policy works, in order to help them understand that lots of coverage can indeed be affordable. For that reason, and others, umbrella rates for the average household tend to be quite affordable. For a household with 1 home, 2 cars, and 2 drivers with clean driving records, $1 million of personal liability coverage can cost just $150-250 annually. .
Having a personal umbrella is vital to protecting a customer's assets (including future earnings), in the event that they are sued. A personal umbrella also covers defense costs. 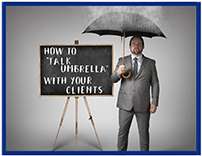 In light of what it can cost a customer who doesn't have the extra liability from a personal umbrella, agents should be quoting a personal umbrella to every client. Once you've offered coverage, it's also wise to document that offer and if the customer declines the coverage. Download our customizable declination form to make that process quick and easy. Big "I" members enjoy access to the IIABA-endorsed RLI Personal Umbrella, which offers limits of up to $5M ($1M in NM) and excess UM/UIM nationwide. Obtain a quote today at www.bigimarkets.com or at www.iiaba.net/RLI. When looking for quick strikes of information on focused topics the VU's monthly Lightning Learning series is there to help. The next extended webinar will focus on ISO Personal Auto Changes and includes a 'seat' to attend live, a link to the on-demand recording, and a written transcript. Consider presenting conference style for the entire agency to benefit. Please send any questions to VU staff..
1. On this date in 1983, fugitive members of this labor union were arrested and printing/broadcast equipment was seized by police in several cities. Six years to the day later it was granted legal status. What is the name of the labor union? 2. Jewelers Mutual Insurance began in what year? 3. Last summer on Ile de Re, France a new vending machine made it possible to purchase ________ any time of the day? TB - RLI Insurance got their start in the 1960s as one of the first insurers of ______? Congratulations to our agent in Congratulations to our agent in Kansas on an Affluent Homeowners - New Business sale of $10,003 in premium!